Facilitating Alignment of IT to Business Strategy! Today's technology permeates through every aspect of your business. 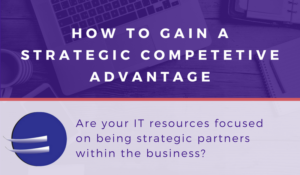 In order to achieve a competitive advantage, Information Technology is required to be part of your overall strategic direction. As a middle market business, you understand your strategic business goals. We can show you how technology can fit within your strategy to accomplish those goals, identify process improvements to help reduce your budget, or perform a team assessment to see what knowledge gaps are needed to meet your corporate objectives. Take advantage of adding a Proactive Business Strategist focused on aligning technology with your business strategy. Schedule a free consultation to begin conversations. We can review your department, processes, team, and budget to provide a "Opportunities for What's Next" assessment packet. This is a critical step in assuring your business objectives and your IT strategy is aligned. What is ‘Technology Debt’ costing your organization?